Wax is one of the earliest known mediums for portraiture. 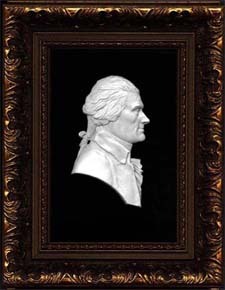 Miniature wax portraits executed in bas-relief were exceedingly popular from the mid 18th century until the introduction and popularization of photography in the 1840’s. The portraits were generally intended for reproduction in small quantities by use of a plaster mold for the sitter's family, but larger quantities were made of popular heroes with a wider appeal. The finished portrait, usually under 4", and in shallow relief, was mounted on reverse painted glass, wax covered plaster or a sheet of wax and then framed. Josiah Wedgwood took advantage of the popularity of the wax portraits and hired modelers to create over two thousand images to be reproduced in jasper ware. The resulting medallions pictured the crowned heads of Europe, the Emperors of Rome and his "illustrious moderns". In my work, I have tried to adhere to the high sculptural standards for portraiture in the 18th and early 19th century. I intend to recreate the look, color and texture as well as the scale of the earlier wax portraits. In beginning a portrait, I refer to art of the time, searching for paintings, drawings and sculpture of the person to be portrayed. Usually several sources are available to me. In the case of military attire, I closely recreate what is shown in the art. In civilian dress, I have a little more freedom. I hope the resulting bas-relief captures the spirit of the earlier portraits and brings the person portrayed a little closer to our time.